Kick your range training, tactical exercises, and plinking activities up a notch with this new 400-round case of 7.62x51mm ammo by Magtech First Defense. The military-grade 7.62 NATO originated in the early 1950's and has proven to have staying power with many military organizations around the world. 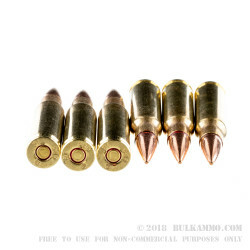 These centerfire rifle cartridges feature 147gr full metal jacket projectiles that will pound your target with a hard-hitting energy transfer. The muzzle energy of these rounds sits at about 2442 ft/lbs with a matching velocity of 2735 fps. These rounds lose velocity slowly which helps them maintain flatter trajectories down range. The FMJ resists expansion and is highly accurate at long distances. 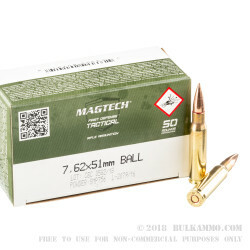 Magtech uses Boxer-primed brass casings for these 7.62 NATO cartridges. The casings are new-production, non-corrosive, and reloadable. If you're itching to give your M14 a workout, don't miss this opportunity to stock up on 7.62x51mm ammo. Order your 400-round bulk case today! A: This projectiles will be magnetic. 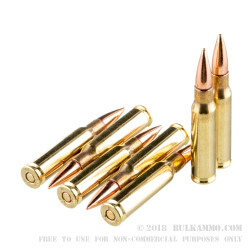 The 7.62x51 ammo is required to be bi-metallic according to NATO requirements. Q: Will these projectiles attract a magnet? I need it to pass the magnet test for use at my range. Thanks! A: No, these will not pass a magnet test. 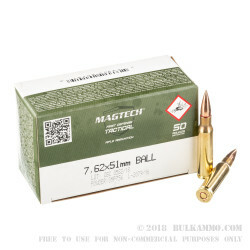 All true NATO 7.62 ammo uses a bi-metallic projectile.